Have you ever thought of getting a magical tattoo? About five hundred years ago perhaps one-thousand indigenous cultures practiced tattooing. Today though, most of them have completely vanished and only a few survived. Therefore we proudly present a once in a life-time offer. In Thailand the tattoo artists are monks who create traditional designs on the body; magical tattoos. According to their makers those charms have strong guardian significance. It is believed the protector spirits bring luck and health to the travelers. Tattoos express the bond between humans and Mother Nature. The ancient technique of skin-stitching is still well known at the temple Wat Bang Phra. The tattoo is created by a master monk - the Arjan. The recipes for the ink are handed down from generation to generation containing secret and magical ingredients like sandalwood steeped in herbs. Some Arjan even blend the ink with holy water as it is believed the wearer of such a tattoo will be treated with deep respect. Wat Bang Phra accommodates several monks who still master traditional tattoo-making and who will bless their work afterwards; among them the well-known Luang Pi Nunn. For further information about the holy Sak Yant Tattoos and the tattoo temple Wat-Bang Phra please visit the webpage about the temple >> www.Wat-Bang-Phra.com >>. Take two weeks off from work or even a month. You only have to inform us about your arrival date at Bangkok Suvarnabhumi and you can leave the rest to us; of course the same applies to your departure as well. We will arrange a chauffeur who will collect you directly at the airport’s arrival area to take you to the seaside resort Cha-Am about 200 kilometers away where a spacious cottage awaits you. 140 square meters will give you all the room you need. The house is fully furnished in a fair and comfortable style. It has a complete kitchen and a huge living room, an extra dining room as well as two bathrooms, and two bed rooms. You can enjoy nature’s beauty resting in the rain garden. The terrace and a huge balcony give you plenty of opportunities to relax outside. Please look for more pictures and further unforgettable impressions as well as additional information about your spacious cottage at the right side menu. Besides your drive to Wat Bang Phra, where you will receive your magical tattoo from a monk, we plan additional day-trips with an English-speaking tour guide for you. Please give us a note of your arrival and departure date and leave the rest to us. We will organize a free chauffeur who will personally collect you at the airport. Your vacation time will start with a beautiful drive to your cottage. Of course the chauffeur will also take you back to Suvarnabhumi Bangkok airport in time for your return flight at the end of your vacation. We will take you to Wat Bang Phra where one of the holy monks will apply a Yantra Tattoo. 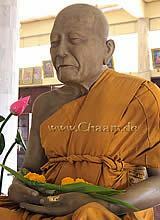 We will of course try to arrange for Luang Pi Nunn, the most famous monk of the temple, to create your magical tattoo. For more information about the special and unique magical tattoo from Wat Bang Phra and the famous tattoo master Luang Pi Nunn please go the website of the temple >> www.Wat-Bang-Phra.com>>. Our offer refers to the creation of one magical tattoo. In case your fellow travelers would also like to be tattooed at the temple, we would ask you to tell as before your departure, as we need to inform the monks beforehand so they can make the necessary arrangements. An additional tattoo costs 50,00 Euro per person. This tour will take you to one of the most famous and beautiful areas, Kanchanaburi. Your first stop might be Damnoen Saduak, currently the biggest still existing swimming market in Thailand. We can arrange for you to enter a boat and be a part of this historical happening. We will further take you to where the well-known film “The Bridge on the River Kwai” was shot. Take a boat-tour through a beautiful landscape, watch elephants and water buffalos in their natural surrounding! Also discover a part of Thailand’s history! There are many places of interest, for example the JEATH-war-museum remembering the so called death railway. During WWII the Japanese, occupying force in Thailand, forced prisoners of war to build a train way from Thailand to Burma. Many people died because of the inhuman conditions. The most impressive part of your journey will be the beautiful landscape, though, so different from what you know from Europe. It’s breathtaking! Thailand's prosperous Old Kingdom, Ayutthaya, is an impressive location less than one hour from Bangkok. This historical place used to be the rich main city of the Siamese Kingdom Ayutthaya and therefore was the metropolis of South-East -Asia. Today only a number of temple ruins bear testimony of that great time, but if you want to explore Thailand’s historical sites, this is certainly the place to be. The ancient town with its many temples, also called Venice of the East because of its canals, still shows the impressive wealth former days. Also visit the temple Wat Yai Chai Mongkol and don’t miss the huge Buddha Statues with their golden fingernails! It is a breathtaking sight! Make a day-trip to Phetchaburi and visit the mountain Khao Wang (meaning Palace Hill). You will enter a simply magnificent palace and temple site, located in a breathtaking nature. It was King Mongkut (Rama IV) who fell in love with the superb landscape and in 1860 he constructed a palace to stay in during his many trips to the area. It is an awesome construction site that will make a deep impact on you. But be warned: you have to go uphill! The mountain might only be about 100 meters high, but especially the burning sun can make it a rather long trip. After your visit you will have the opportunity to shop in one of Phetchaburi’s large malls. This will give you an impression of everyday life in one of Thailand’s regional cities! Once a week our cleaning team will tidy up and clean the cottage. They will also change the bed linen and the towels. Everything will be cleaned, swept and wiped, so you can enjoy a spotless house again for the rest of your stay. Usually guests of the resort have to pay 80 THB (around 2 Euros) to use the full-size and clean pool per day and person. Your stay though includes the free usage of the pool. For booking and more information go >> Here >>!